India lead acid battery market has registered steady growth during the past few years. Surging awareness towards utilization of renewable energy, rising demand for power backup as well as growing automotive industry are driving the growth of lead acid battery market in India. Further, government initiatives such as target to achieve 175 GW renewable energy by 2022 and FAME (Faster Adoption and Manufacturing of (Hybrid &) Electric Vehicles) scheme subsidy provision for purchase and manufacturing of electric vehicles would further fuel the demand for lead acid battery during the forecast period. In addition, presence of lucrative replacement market in the country is further complementing the growth of lead acid battery market in India. Further, motive/traction battery is anticipated to exhibit second highest growth rate over the coming years on the back of its usage across railways coupled with growing adoption of electric vehicles in the country. In terms of construction methods, flooded battery captured majority of the India lead acid battery market share in 2017; however, VRLA segment is likely to display higher growth rate owing to its benefits over flooded ones, such as advantage of immobilized electrolyte in VRLA battery which prevents electrolyte leakage and do not require maintenance. The India lead acid battery market report thoroughly covers India Lead Acid Battery market by types, construction method, applications, and regions. 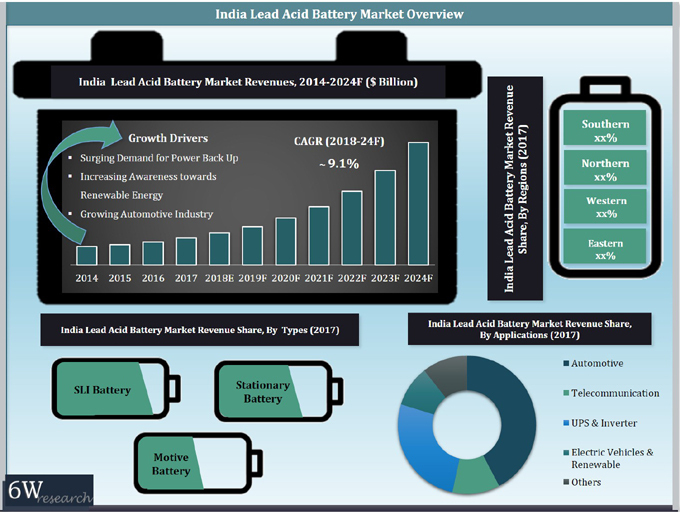 The India lead acid battery market outlook report provides an unbiased and detailed analysis of the India lead acid battery market trends, opportunities/ high growth areas and market drivers which would help the stakeholders to decide and align their market strategies according to the current and future market dynamics. 15.2. Amara Raja Batteries Ltd.
15.3. Luminous Power Technologies Pvt. Ltd.
15.4. HBL Power Systems Ltd.
15.5. Okaya Power Pvt. Ltd.
15.6. Su-Kam Power System Ltd.
15.7. Southern Batteries Pvt. Ltd.
15.9. AMCO Saft India Pvt. Ltd.
15.10. TATA Autocomp GY Batteries Pvt. Ltd.